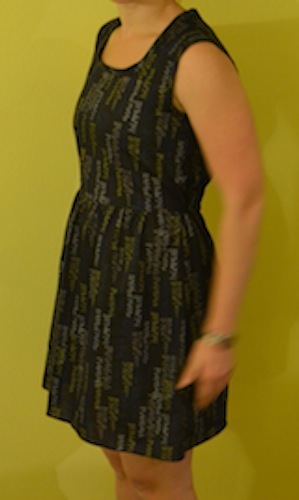 For this version of the Lilly dress I decided to go with the plane/flat front. With the main color of the material being so dark the pleats wouldn’t show up. The fabric is an amazing voile by Art Gallery Fabrics. If you haven’t used anything by them yet I highly recommend doing so. Reasonably priced, but the quality is outstanding. Cuts and sew great. Holds color really well. And even their quilting cottons are so super soft that I use them quite often for my girls clothes. This dress ended up being slightly shorter than what I normally would sew simply because I made a math error when I was purchasing it. I needed another 4 inches to sew my normal hem, oops. But it turned out for the best since this fabric is so light weight and flowy (pretty close to a cotton lawn) I ended up using a rolled hem. Great excuse to learn how to use one of my new feet for my machine! It turned out fantastic! Not half as scary as it looks. One of my favorite parts about this dress (beyond that its my pattern and I know it fits perfect every time), is that it maybe takes me 2 hours to make the whole thing from being to end. And that includes making my own bias tape for the neck and arm bands. 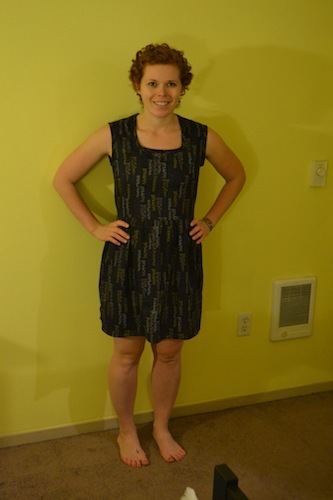 I am really happy with this version of the Lilly Dress! Now just need to wait for the weather to be above 40 degrees to wear it.